Every home should have a disaster supplies kit that contains at least the basics: a flashlight or battery-operated lanterns, portable radio, extra batteries, first aid kit, bottled water/juices, nonperishable food, manual can opener, and extra blankets for warmth. Other items to consider including in the kit are extra prescriptions and items for babies or family members with special needs. Store an ample supply of items necessary to sustain every member in the home for at least three days, in case you’re snowed or iced in. If possible, before winter sets in, invest in an alternative heating source, such as a fireplace, propane or kerosene heater, or generator - in case of an extended power outage. Check your homeowner’s insurance policy to make sure coverage is adequate for the type of winter weather in your area. Learn what is excluded from the policy. Make sure auxiliary heaters and fireplaces are adequately maintained and serviced. Many fires related to auxiliary heating sources are preventable through simple maintenance. Before installing a wood-burning stove, check with local fire officials as to codes and proper installation techniques. Do not store kerosene in a non-approved container or inside your home and be sure to keep flammable materials (walls, curtains, etc.) away from all heat sources. During the winter, drain pipes if your power goes off or if you plan an extended stay away from home. To drain, turn off the water heater and main water supply, open all faucets in the house and drain the system by keeping the valves open. Drain all toilets by holding the lever down until the tank empties. If well water is used, the pump’s electric switch should be shut off and the pressure tank and system should be drained. Remove dead tree branches. 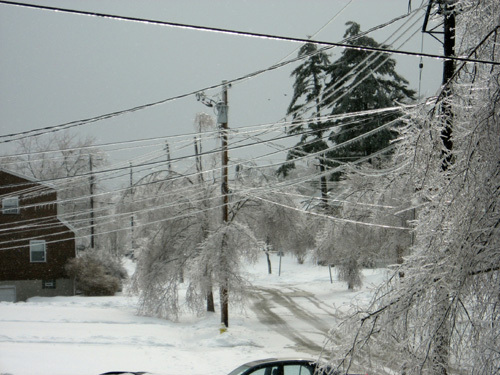 Ice and snow, combined with winter winds, can cause limbs to snap and break and could do damage to your home. Clean gutters. Snow and ice can build up quickly, especially if your gutters are clogged with debris. When thawing begins, water from melting ice has nowhere to drain and can back up under your roof and eaves, causing water damage to walls and ceilings. Consider buying screens to keep your gutters debris-free. As far as Ohio law goes, it has long been established that homeowners do not have a legal obligation to shovel when there is a natural accumulation of snow and ice. In December 1993, the Ohio Supreme Court upheld this concept when a guest attempted to sue a homeowner in Franklin County for a slip and fall outside of the homeowner’s house (see Brinkman V. Ross). Although there is no legal obligation in Ohio to shovel and clear sidewalks, homeowners should at least try to maintain them. Some states have laws in place requiring snow and ice removal; Ohio does not. However, a homeowner would be liable if someone decides to sue as a result of tripping over a crack or other irregularity on a homeowner’s walkway. Also, if someone slips on ice that was formed because of a poorly positioned down spout, the homeowner could be held liable. Local municipalities may invoke snow removal ordinances. If your city or township has an ordinance that requires residents to keep walkways free of snow and ice, then you have a responsibility to maintain your sidewalks. Some Ohio cities with snow removal ordinances levy fines for not removing snow in a timely manner, while others issue warnings. However, a local ordinance does not automatically implicate a homeowner if someone slips and falls on un-cleared property. The Ohio Insurance Institute suggests checking with your local municipality on any snow removal policies or requirements.